Caucasian bees are known for high propolis production. The propolis they produce is soft and sticky, which can make it hard for beekeepers to inspect the hive. They stop producing brood in the fall and tend to overwinter quite well. In addition, because they’re from a cold region they can forage on colder days than other bee races. Caucasian bees show some resistance to European FoulBrood and are not overly inclined to swarm. 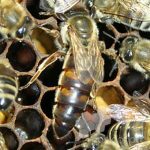 Due to their high propolis production, they are not known for being honey comb producers and tend to conserve their honey stores as a result.